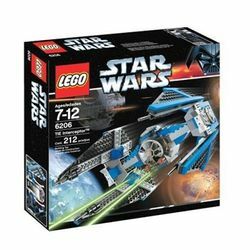 6206 TIE Interceptor was released in 2006 as part of the Classic Star Wars line. Included is one TIE Pilot minifigure. The TIE/In Starfighter, or the TIE Interceptor, was a TIE series starfighter used by the Galactic Empire. The TIE Interceptor was identifiable by its arrow-shaped solar collection panels, a distinct difference from the hexagonal solar arrays of its predecessor, the TIE Fighter. The Interceptor was one of the fastest starfighters in the galaxy at its prime, nearly rivaling the Alliance's RZ-1 A-wing interceptor. This is a description taken from LEGO.com. Please do not modify it. Challenge the Rebels! Blasting out of Star Wars Episode VI: Return of the Jedi, the TIE Interceptor is the fastest fighter in the Imperial fleet! Open the cockpit canopy and fold down the instrument panel to put the TIE pilot inside and recreate your favorite Star Wars battles. Cockpit opens and instrument panel folds down! Facts about "6206 TIE Interceptor"
This page was last edited on 9 January 2016, at 19:32.